This disc opens with the Quartet for four violins, designed as a teaching piece in 1949. The three contrasting movements display an elegant, refined technique with a strong influence of neo-classicism (something that crops up regularly on the disc and which Bacewicz seems to have imbibed during her time in Paris in the 1930s). There are folk hints too and some imaginative use of texture in writing for four violins. The Maziovian Dance for violin and piano from 1951 starts with a lush romantic feel but a sparkily folk-ish section also suggests Bartok. A number of pieces on the disc also remind me of British music from the 1950, hardly an influence perhaps more of a mutual influence by strands of European music. The Trio for oboe, violin and cello from 1934 is elegantly expressive in the neo-classical style, the three movements moving from perky to slow and back again, with some spiky harmonies and a distance echo of Jean Francaix. Also from 1934, the Theme with variations for violin and piano combines folk influence with neo-classicism and some imaginative writing for the violin. In her booklet note Diana Ambache suggests the theme came from one of Bacewicz's childhood holidays with her father's relations in Lithuania. The Quartet for four cellos is one of the most recent works on the disc, dating from 1964. In two movements, Narrazione and Riflessioni it is an intense piece, full of dark sonorities and spiky harmonies. It is a tough piece with an edgy atmosphere and sense of mystery, all in all rather terrific. Not surprisingly Polish Dance for violin and piano, from 1948, is far more folk-inspired. The Trio for oboe, harp and percussion dates from 1964 but had to to wait until 1974 for its premiere. Bacewicz uses the slightly unusual combination of instruments to create some spare yet transparent textures. Still rather neo-classical in style, the work is more intense than some of the earlier pieces and the oboe is very much the protagonist. The final movement is marked 'Giacoso' but it is still spare and very intense. A wonderful and rather imaginative piece. The final piece on the disc, Slavonic Dance for violin and piano from 1952 has a very different atmosphere, very much neo-classicism meets Bartok. This is a terrific disc, bringing out the unusual strands of Bacewicz's chamber music rather than simply recording a selection of string quartets. 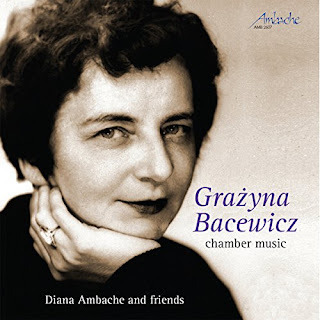 Diana Ambache provides an excellent booklet note introducing Bacewicz's music and career, and the performances from all concerned are admirable. A fine introduction to this neglected composer.